How to watch DVD movies on Archos AV700? 4Media DVD to MP4 Converter is specialized in converting DVDs to MP4 as well as AVI videos compatible with most popular digital players. With the converter, it's easily to convert DVD to AVI for playing on Archos AV 700, AV500/GMini 402. We will teach you how to achieve this. First, please download 4Media DVD to MP4 Converter. It's for free trial. Then, install and launch the software. Here we go. Insert the DVD disk you want to convert into your DVD-ROM, and click the "Add" button to load it. 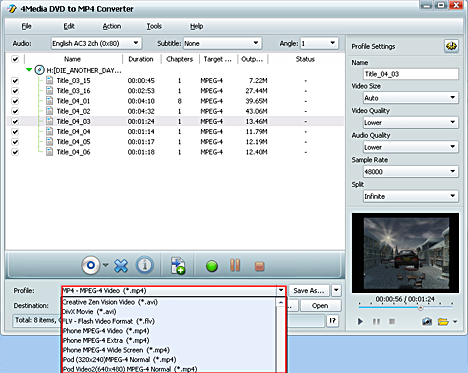 As you can see, the DVD to MP4 Converter supports DVD folder and ISO file also. As the picture below shows, expand "Profile" drop-down list and scroll to select the format for Archos. There are two types of format provided: Archos AV500/GMini403 Video (*.avi) and Archos AV 700 Video. Choose the format according to your device type. Besides, you can customize the output video yourself - change the default DVD audio, subtitle, and angle, Zoom mode for output format. 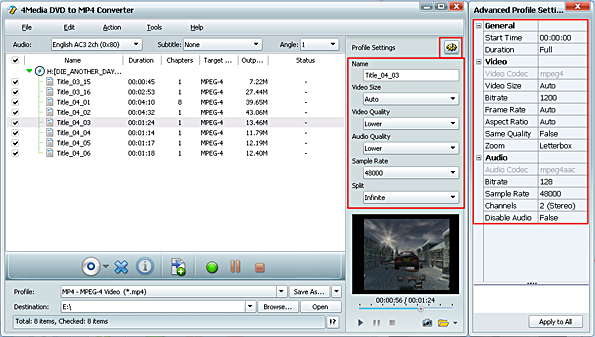 Furthermore, you can change output video size, video quality, and channels in Advanced profile setting panel. After all settings, click the green "Convert" button at the bottom to start the DVD to Archos converting. And the conversion would be finished in a few minutes, depending on your computer. It's quite easy. 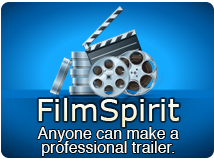 Free download 4Media DVD to MP4 Converter to have a try.